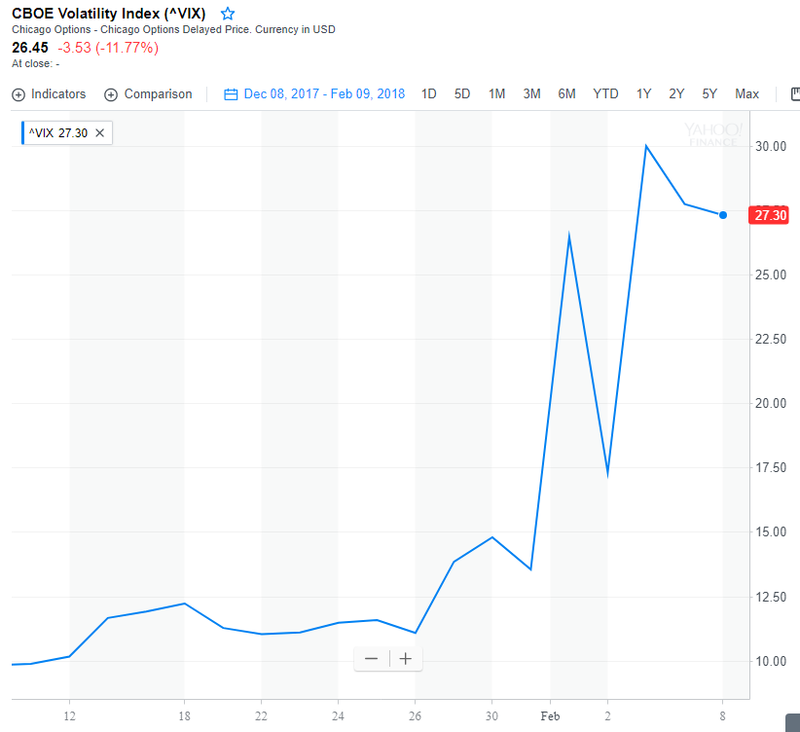 The CBOE Volatility Index (VIX) is a measure of expected price fluctuations in the S&P 500 Index options over the next 30 days. 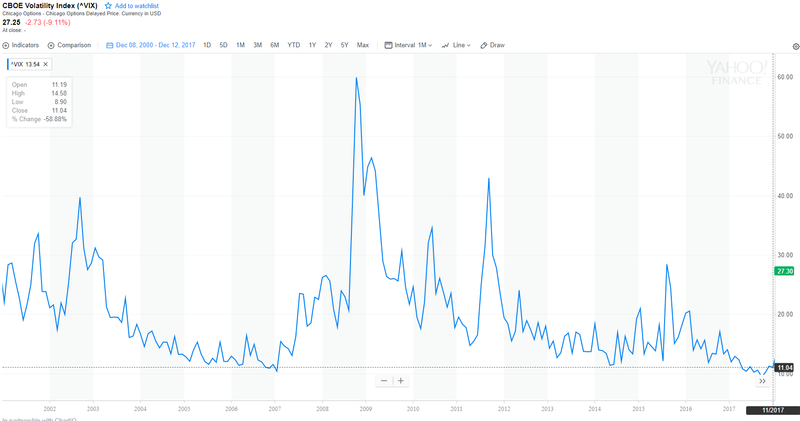 The VIX, often termed as the “fear index,” is calculated in real time by the Chicago Board Options Exchange (CBOE). The key words in that description are expected and next 30 days. The predictive nature of the VIX makes it a measure of implied volatility, not one that is based off historical data or statistical analysis. The time period of the prediction also narrows the outlook to the near term. The easiest way to trade this in the UK would be via leveraged spread betting. This is also the method I use to hedge foreign currency exposure as you can place highly leveraged trades with little margin (for now, that could all change with the new MiFID II regulation). Spreadbetting works by betting a £ amount on a point change in the instrument. So for arguments sake, if the VIX is 10 and I bet long £100 per point, I make £1000 if it goes to 20. This was the chart I was faced with at the time. The hedge would involve going long the VIX futures. This would be in essence catastrophe insurance for big market sell offs. At the time, the trade looked like a great asymmetrical bet. With a fixed £ bet per point the downside was limited but the upside was greater. I’m sure most of you noticed this week that market volatility spiked. Here is what happened to the VIX. And so, I would have made a killing. But I didn’t place the trade. So why? When I looked into this bet, I noted that you can’t directly bet on this index, you bet on futures. This really changes the risk/reward structure. Futures have an expiration date e.g. currently the Feb contract trades at about 22.50 and the March contract at 19.1. You may notice that is quite a difference, and both are quite different from actual current VIX figure. At the time of the trade I didn’t know how long this hedge would take to pay off. Take a look at the first chart above and see the steady declines from 2004 to 2007. Each month the trade rolls over to the next month’s contract. When the contract has expired, it will be virtually the same price as the actual index. So take the Feb contracts for example. At the time, the expectation was that the VIX would increase, so futures were priced at around 12 compared to the VIX itself which was at around 10. The March futures were at around 15 in December. This means any trade would be costing around 1 point per month. The size of the hedge would need to cover a sudden drop of say 5%, which would be a spike to say 25 on the index. So an appropriately sized trade would cost around 5% / 25 = 0.2% per month. So you’d have to hope that the trade worked within about 25 months. That may sound like a long time, but the costs compound every month at which point if it paid in month 25 you would only be winning your fees back. For this reason, I didn’t consider it a suitable hedge. My currency hedges are essentially free because the expectations of rising and falling currencies vary both ways over time. But with the VIX, when it’s at all time lows, the futures will always be priced higher.